And this is what I've got to do. And I've sent 12 bags to Charles, Binka and Suzanne. 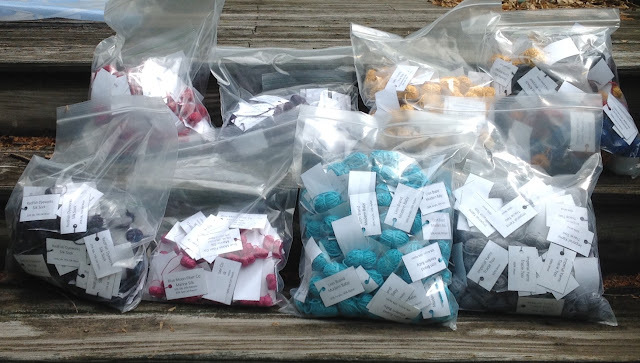 So far we have 17 sponsors and 29 yarns to taste at the Yarn Tasting at the San Diego conference. It should be a great evening! I had a special request to do a video on the M1o increases used in mitten cuff in Level 1 of the Master Hand Knitting Program. I ran this past the co-chairs first as I tend not to do things that directly related to the program. Since the mitten was an addition to the program after I completed it, I am ashamed to admit I have never knit it. I really wondered why people had trouble with the increase. M1o increases are just about the easiest to work. You just knit into the horizontal strand between the two stitches. After knitting it, I see why. The cuff is a traditional Estonian (?) technique that produces an entrelac effect. The reason the increases are hard to see is that they are worked between a regular old knit stitch and a knit stitch created on the previous row as an M1o. The horizontal strand is hard to see. The next two photographs show the needle lifting the horizontal bar. I used two photos. Hopefully, you can see the strand. You really have to dig for it. The key thing is to make sure it is the strand coming out of the stitch on the left needle. The other common mistakes in the mitten is that the knitter ends the cuff after Round 16. 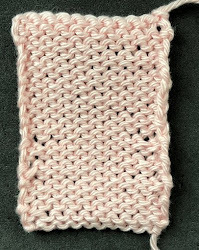 There are 20 rows in the cuff. Make sure you complete all of them. Another mistake is not to measure accurately. Remember to follow the pattern exactly. That is the test. Don't adjust it to fit your hand. As the photos above show I haven't been knitting much. 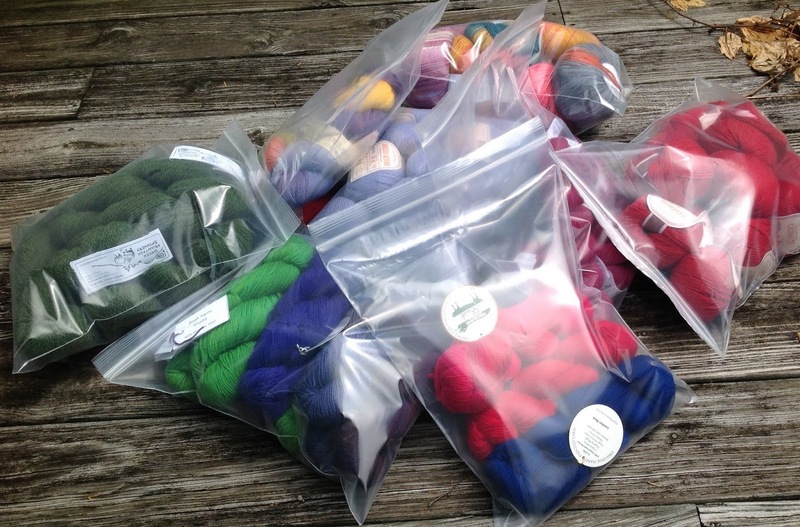 I have been making labels, measuring yarn, winding balls, etc. One of the things we are doing for this conference that we haven't done before is to have a kit for sale which features a pair of socks using the official colors of the conference. (To see these colors, go to the website. We worked with Kate from A Hundred Ravens to come up with the right colors. She did an amazing job. I got the test yarn this week. The kit will come with the yarn and two patterns...socks and matching fingerless mitts. There is enough yarn in the kit for both. The photo below distorts the colors somewhat but you can get a general idea. 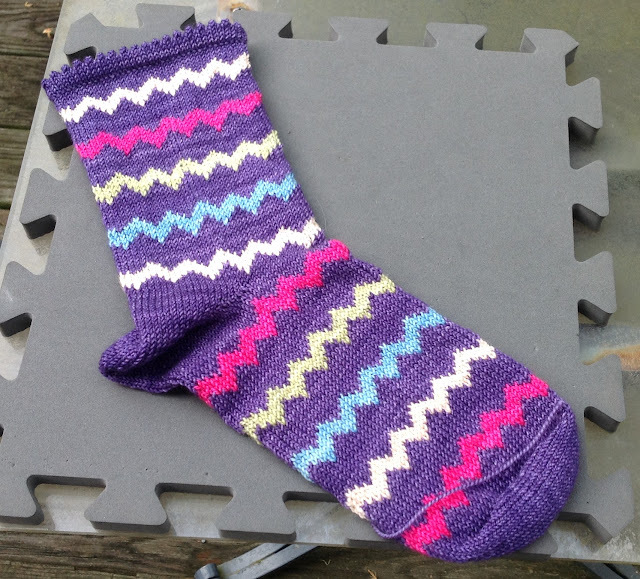 Since one of the designs we use for the TKGA booth is a chevron, I used the pattern for my Rick Rack Socks in the Summer issue. I plan on finishing the other socks and the mitts at TNNA so I can send them off to the office for photography. Remember, I won't be posting again until two weeks but I will have a report about TNNA.